1. Combine all ingredients except the chipotle salt into a shaker with ice. 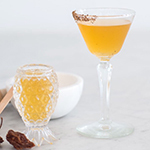 Shake and strain into a glass rimmed with chipotle salt. Serve.